Sometimes I feel like Trader Joe’s really gets me. Almost all of their dark chocolate is sans dairy. They sell olive oil in massive quantities for pennies. And they have at least 10 banana related products in their store at all times. (I’m not sure if it’s actually 10… but it’s a lot!) One of those things new this year was Monkey Business Trex Mix. O.M.G. I was in love. 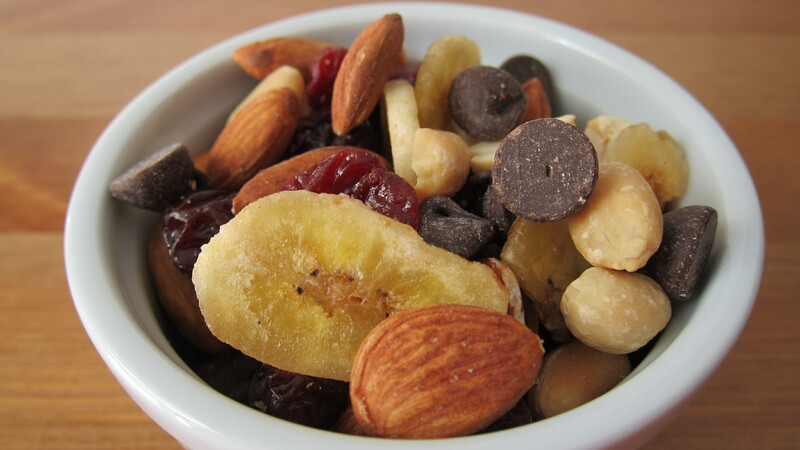 It had banana chips, chocolate clusters, peanuts, and dried cherries. All of my favorite things in one bag. (not really the cherries, but more fruit is never bad). Then disaster struck. Suddenly it disappeared. Gone from the shelves yet to be restocked. I’d know cause I check every week and often mention it when the cashier makes awkward small talk as you check out. I researched it online (yes I am a loser) and found a complaint that someone found glass pieces in the chocolate clusters. The nerve of that person ruining my bag of favorite things. I’ve pretty much given up hope that I’ll ever see the trex mix again. Luckily for me TJ’s sells all the things that came in the mix and I can make it myself! Crisis avoided. Inspired from Trader Joe’s Monkey Business Trex Mix… R.I.P. Mix all the ingredients in a large bowl. Store in an airtight container. I eat this all the time…breakfast, pre-gym, at the beach, whenever! If it’s any consolation, it’s in the store now! Eating it as I type. and while your recipe comes close, it’s missing those chocolate nib clusters that are my all time favorite part! They finally brought Monkey Business back to our local Trader Joes!